The Analyst Insider aggregates our recent research news, a featured Executive Foresights, and other relevant content. Transformative technologies have entered the manufacturing sector and have started doing what they do best: transform it. Technologies such as additive manufacturing, IIoT, edge and cloud computing, machine learning and artificial intelligence, advanced robotics, augmented reality, production simulation and wireless connectivity have and will continue to impact manufacturing, automate it and augment the work and abilities of humans on the shop floor. Incremental changes such as improving the performance of legacy machines with new component systems (sensors, motors, actuators, and drive belts, for example) will also continue, but transformative technologies will reshape the way manufacturers build products and do business. Download our Industry 4.0 Maturity Model and discover the different stages that manufacturers need to progress through before entering the final phase: lights-out manufacturing that allows factories to operate without humans on site. What Awaits the Telco Ecosystem as it Targets Manufacturing? Nokia, one of the big three telecom equipment vendors, has created a private LTE network with China Unicom for a BMW Brilliance Automotive Ltd. plant (BMW Group JV) in China. The plant will feature connected video surveillance equipment, asset tracking, connected tools, connected PLCs, connected AGVs, and various other equipment with Multi-access Edge computing (MEC) over the private LTE network. Additionally, Nokia has partnered with Bosch Rexroth as Bosch attempts to build cellular connectivity into several pieces of its industrial equipment such as PLCs, drives, or even tools such as screwdrivers to sync wirelessly with MES systems and ensure that each screw gets the right amount of torque at the right angle. Over the past two years, network vendors have touted private LTE as a stepping stone to 5G in the manufacturing sector but have not seen the demand or adoption they initially expected. Announcements such as these provide an opportunity for Nokia to demonstrate the business benefits of its technology in the sector. 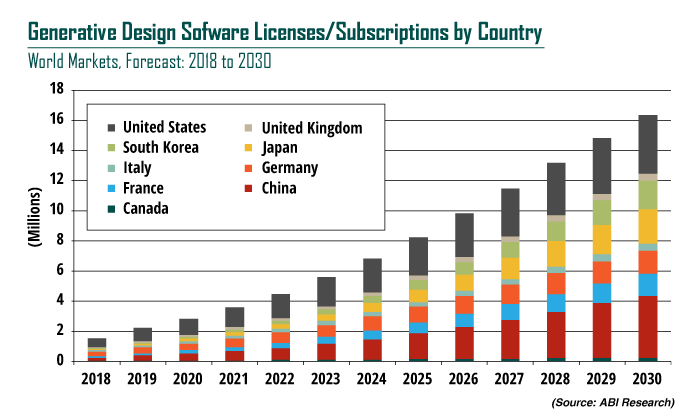 The market for software with generative design tools will grow at a compound annual growth rate of 24% to reach US$44.5 billion for over 16 million seats in 2030. According to a new report published by ABI Research, these sales include licenses and subscription revenues for Computer Aided Design (CAD) products with generative design tools or standalone generative design software products. “Today, many engineers have started to use topology optimization tools, but design software tools have already evolved,” said Pierce Owen, Principal Analyst. “While both topology optimization and generative design enable the design of lighter, cheaper components while maintaining strength and solidity, ultimately creating a higher quality product, generative design creates, or generates, the geometric shapes from an engineer’s requirements rather than changing existing shapes. Also, unlike topology optimization, generative design creates many iterations, variations, or alternatives for engineers to compare, rather than simply removing unnecessary pieces or particles from one pre-existing design.” Read more. Mobile devices, particularly smartphones, are increasingly featuring embedded machine vision technology, which offers a wide range of visual applications that scan, analyze, and interpret images or video. ABI Research forecasted that shipments of mobile devices, including smartphones, tablets, and wearable cameras, with embedded machine vision technology, will increase from 45 million in 2018 to over 590 million in 2023, at a CAGR of 67%. “Smartphones offer a convenient form factor for machine vision, and with an increasing number of Artificial Intelligence (AI) chips in use, such as Apple’s A12 Bionic and Huawei’s HiSilicon Kirin 980, its prevalence is likely to increase,” said Stephanie Tomsett, Research Analyst at ABI Research. “For devices without an AI chip, as long as the smartphone has a camera and cloud connectivity, the technology can still be leveraged.” Read more. Amazon Winning The Voice Assistant War – But For How Long? "Google has access to over 20 years of search data and access to more than 50 million voice samples, leveraged from its Android platforms, which can ultimately be used for machine learning," opines Jonathan Collins, research director at ABI Research. "The Google knowledge graph is the most extensive created, providing access to approximately 70 billion facts that have been collectively grouped for link prediction. This extensive database drives the Google Assistant, along with Google’s extensive knowledge of interpreting textual search data that allows the Google Assistant to interpret semantics so well." Read the full article. "The drastic price cuts that we've seen certainly don't bode well for the platform," echoed Michael Inouye, principal analyst for ABI Research. "We should soon learn if the PC manufacturers are committed to the market." Read the full article. ABI Research provides strategic guidance for visionaries needing market foresight on the most compelling transformative technologies, which reshape workforces, identify holes in a market, create new business models and drive new revenue streams. ABI’s own research visionaries take stances early on those technologies, publishing groundbreaking studies often years ahead of other technology advisory firms. ABI analysts deliver their conclusions and recommendations in easily and quickly absorbed formats to ensure proper context. Our analysts strategically guide visionaries to take action now and inspire their business to realize a bigger picture. For more information about subscribing to ABI’s Research Services as well as Industrial and Custom Solutions, visionaries can contact us at +1.516.624.2500 in the Americas, +44.203.326.0140 in Europe, +65.6592.0290 in Asia-Pacific or visit www.abiresearch.com. You received this email because you are subscribed to Analyst Insider from ABI Research. ©2018 ABI Research. All rights reserved.